Bangma, Jan Oedses: Typical appearance of a Napoleonic Fusilier of the Line Infantry, c.1812. Jan Oedses Bangma, 26 years of age, a day worker living in Bolsward, was conscripted into Napoleon's army and was registered as a fusilier in the French 124th Infantry Regiment, (5th Battalion) and 2nd Battalion, 1st Company of Napoleons Army on the 27 April 1813. The family home of Arend Barteles Bouma (right) and Trijntje de Groot (left) in Sint Annaparochie, Friesland, Netherlands. Front (left to right): Trijntje Langenberg-Bouma, Arend Bouma and Trijntje de Groot, Bartele Bouma. Trinjtje Bouma receiving order of Orange-Nassau, April 24th 1963. Trinjtje Bouma (1894 – 1982) was honored with the Medal Of Honor, attached to the Order of Orange-Nassau in bronze by royal decree of April 24th 1963. She was honored for: "lid van de Arbeiderszangvereniging Voorwarts te Bolsward" (her membership of the laborers vocal club named "Voorwarts" in Bolsward). The above photo is the award ceremony Stadhuis, Bolsward. Photo: Seated, Trijntje Bouma-Langenberg. 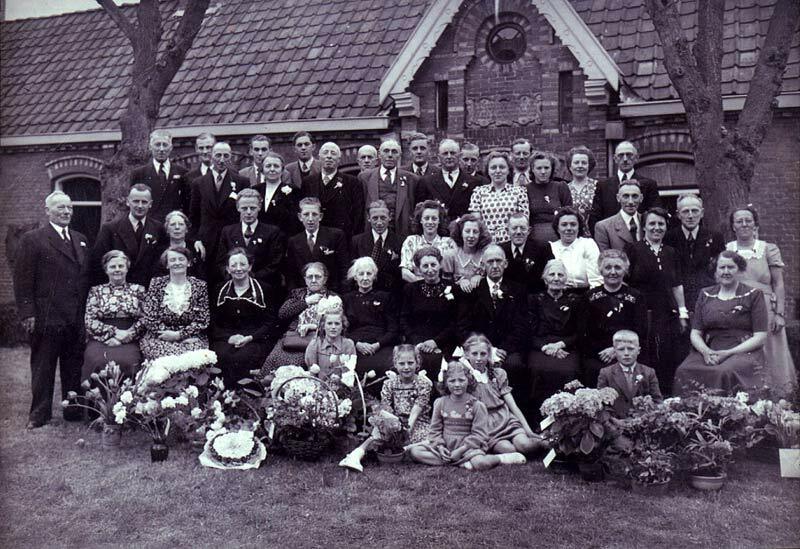 Standing are children and grandchildren of Trijntje, left to right: Arend Langenberg, Trijntje and Co Meinen (daughters of Bettie Langenberg-Meinen), Coe Langenberg-Verkruysse, Trijntje (daughter of Trijntje Langenberg), Trijntje Langenberg, Lena Langenberg, Bettie Langenberg-Meinen, Herman Langenberg, Bertus Meinen and Joop Verkruysse. Grietje Feenstra (right) in 'klompen', Bolsward, Friesland, Netherlands. Grote Pier image: The picture is a copy of an etching from a book written by Frisian Historian Pierius Winsemius (1586 - 1644). The books title is 'Chronycke ofte Historische Geschiedenis van Vrieslant', written (published) in 1622. Title translates to "Chronicles of an Historical Account of Friesland" . The family of Jelke Hartkamp and Sophie de Graaff. Hartkamp, Henny: Wedding photo of Henny Hartkamp and husband. Wedding photo of Henny Hartkamp and husband ? Holslag in Joure, Friesland, Netherlands. Photo left to right, Jelke Hartkamp, Eugenie Sophie Hendrika Hartkamp (Henny), ? Holslag and Sophie de Graaff. Husband and wife, Jelke Hartkamp and Sofie de Graaff. Seated is Siebrigje Hartkamp with her daughters Dina (left) and Clara (right). Siebrigje is holding her granddaughter Siebrigje Bruinsma (daughter of Foekje Laagland). Jelke Hartkamp and Sofie de Graaff and their young family in Indonesia. Froukje Hoekstra (seated) and sister (?). Commissioned by the Overijssel’s governor, J.ter Pelkwijk in his book 'Overijssels Watersnood' covered the entire flooded region in a step-by-step account, identifying the dike breaches, sometimes even the extent of the breach, naming nearly all those who perished including Daniël Langenberg and his family, itemizing the damage done to farms and homes, and detailing stories of heroic rescues as well as tales of great personal tragedies. Knobbe, Marike Koops: Signature of Marike Koops Knobbe, 1835. A copy of the signature of Marike Koops Knobbe from the wedding certificate of her daughter Marchjen Alberts Snoeyer and son in-law Harmen Jacobs Langenberg, August 1835. Daughters and granddaughter of Gerard Knorr and Grietje Hiemstra: Grietje and Gerbrig (rear left to right), Hinke (left front) and Antje and daughter Grietje Feenstra. Antje Knorr's grave is located on the east side of Hervormde Kerk (photo right, source: http://historie.buwalda.nl). The Rijksmuseum collection includes sixty-six ink portraits (Silhouette portraits) of the Batavian Republic Delegates. The portraits were completed in 1796 by the artist Hausdorff. Celebrating the wedding anniversary of Eeltje and Hieke. Jan Laagland, like his father Taede, was a Policeman. This photo is of Jan as a Policeman in Amsterdam. Jan had a long career in the Dutch Police force reaching the rank of major. Jan also taught at the Police Academy in Amsterdam where he was known as Jan 'Lawbook'. Jan Laagland and police dog in Amstelveen, located in the metro region of Amsterdam. Marriage photo of Joop Laagland and Jani. A Bolsward newspaper dated 1914 records in Klaas Hettes Laagland's obituary that Klaas had served as the Bolsward 'gemeente-secretaris', (council secretary) since 1876. Photograph of Foekje Laagland and husband Gerrit Bruinsma. 25th wedding anniversary of Foekje Laagland and Gerrit Bruinsma, in the garden of their family home, Joure, May 1943.
Business of R. Kramer, Clockmakers, Bolsward, Marktstraat 11. Left to right are employees Stornbrinke, Bart Langenberg, the boss C. Kramer (seated) and standing to the right is Piet Boekema. The workers name at the rear is unknown. Family of Harm Langeberg & Trijntje Bouma. Standing rear, left to right, Trijntje, Lena, Bettie and Jacob. Front, left to right, Herman, Bart, seated are Harm and Trintje, Coe (on Trijntje's knee) and Arend (standing). Circa 1951 - Herman (born 1945) and Johannes (1946) Langenberg, the children of Arend Langenberg and Hendrikje Dykstra. Jacob Jacobs Langenberg worked for many years at the skate factory and forge of the firm Ruiter located at number eight Jansstraat, Bolsward. Jacob was employed as master sharpener. Jacob is listed in the 'Algemen Adresboek Provincie Friesland 1928' as a 'smidsgezel' or forgeworker. The gentleman standing in front of the doorway in the white shirt is Jacob. This photo was taken in 1919 when Jacob was about 60 years of age. Prior to WWII Jacob Langenberg had been a soldier in the Dutch regular army. With the outbreak of war Jacob was again recruited into the army. Jacob is pictured third from left. Saloon boat Titania at the shipyard of Jan Langenberg in Leeuwarden. Standing left to right are Johannes Langenberg, assistant van Hiemstra of Koopmans, Gatse Hiemstra, Koopmans, Jan Langenberg. Wedding photo of Janna Jacoba Maria Langenberg and Pieter Hoogmoed. Coat Of Arms of the family of Popma of Terschelling. Terschelling is one of the west Frisian Islands of the north coast of the Netherlands. The Coat of Arms is listed in the 'Stamboek van de Friese adel'. Below is an excerpt from this book referring to Daniël Langenberg and his family.